The GE WattStation on average decreases electric vehicle charging time from 12-18 hours to as little as four to eight hours compared to standard charging "level 1", assuming a full-cycle charge for a 24 kWh battery. At first glance, that sounds like the WattStation has some sort of fast-charging witchery going on, but really it just means that the WattStation can handle Level 2 (240V) charging. The WattStation was brought life with the help of Project Get Ready, the non-profit initiative that grew out of Rocky Mountain Institute's (RMI) Smart Garage Summit. It also can connect to the smart grid and allow utilities to manage and understand vehicle charging impacts. The GE WattStation will be commercially available globally in 2011, and a home version will be unveiled later this year. There's a video of Behar talking about the WattStation after the jump. SAN FRANCISCO, CA, July 13, 2010 – GE (NYSE: GE) today introduced the GE WattStation, an easy-to-use electric vehicle (EV) charger. Designed to help accelerate the adoption of plug-in electric vehicles, GE WattStation significantly decreases time needed for vehicle charging and, using smart grid technology, allows utility companies to manage the impact of electric vehicles on the local and regional grids. 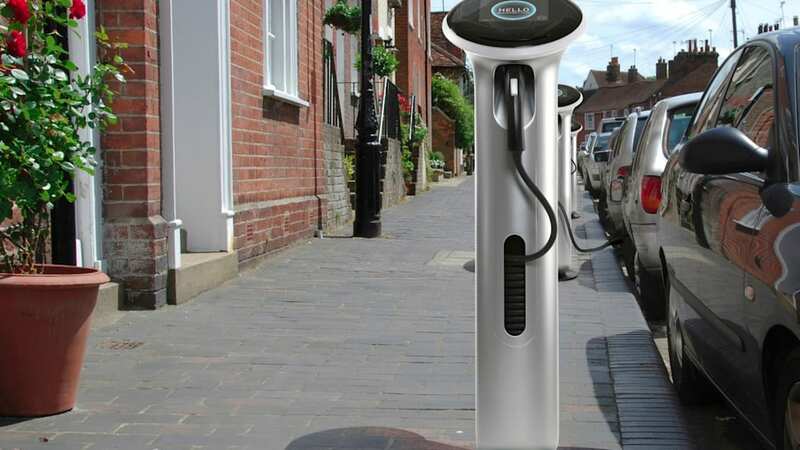 Steve Fludder, vice president of GE ecomagination, said, "Widespread electric vehicle adoption depends on having charging stations that integrate the need for quick charging with the personal need for easy functionality. GE WattStation will meet this challenge." 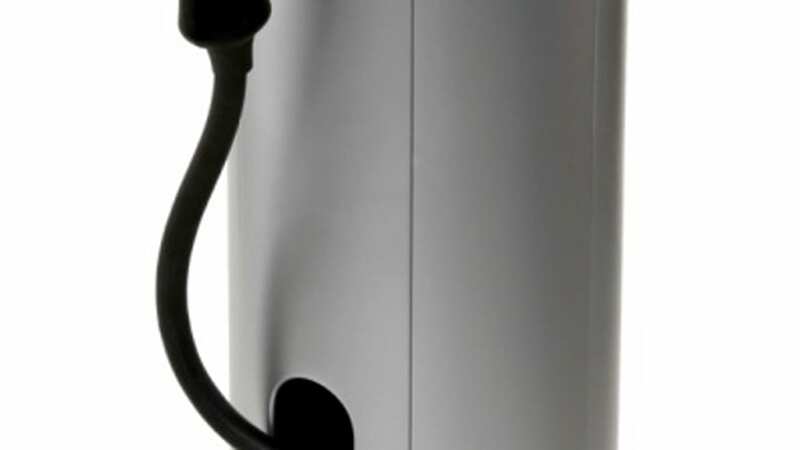 Combining functionality with consumer friendly form from renowned industrial designer Yves Behar, the GE WattStation on average decreases electric vehicle charging time from 12-18 hours to as little as four to eight hours compared to standard charging "level 1", assuming a full-cycle charge for a 24 kWh battery. "Good design is when a new technology enters our life and makes it simpler, beautiful and healthy" said Yves Behar, founder of fuseproject. "The GE WattStation achieves this with a welcoming design that is seamlessly integrated in the urban landscape and becomes a natural part of our daily driving routine"
Dan Heintzelman, president & CEO GE Energy Services, said, "For more than 100 years GE has worked to optimize energy use. Given our expertise in electrical distribution, WattStation is a natural progression in our commitment to creating cutting edge innovation for the next century." 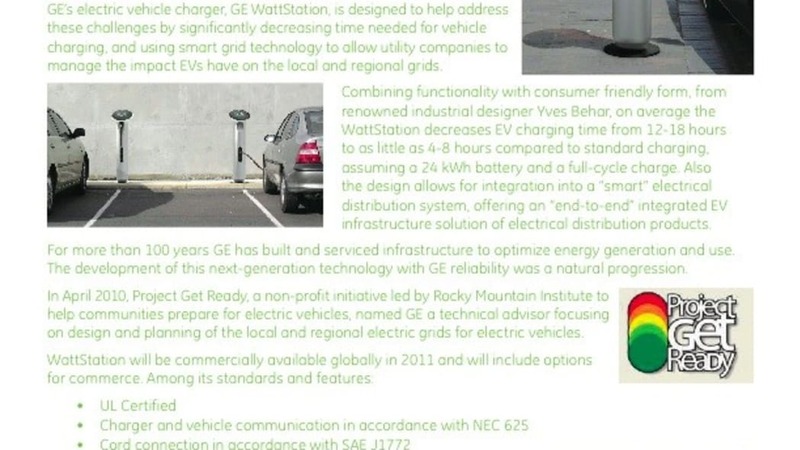 GE WattStation will be commercially available globally in 2011. GE will unveil a specialized home version of the charger later this year. In addition to the GE WattStation, GE recently announced two new partnerships to advance electric vehicle adoption. In April 2010, Project Get Ready, a non-profit initiative led by Rocky Mountain Institute to help communities prepare for electric vehicles, named GE a technical advisor focusing on design and planning of the local and regional electric grids for electric vehicles. In May 2010, GE Global Research and Nissan signed a separate three-year Memorandum of Understanding (MOU) to explore new technologies that are needed to build a reliable, dynamic smart-charging infrastructure. For more information on GE WattStation, including preorder details, please visit www.ecomagination.com/wattstation.